There has been something happening in Vancouver this summer, drawing people to an urban playground underneath one of the city's bridges. Five nights a week, hundreds gather under the Cambie Street Bridge to watch images of Pacific salmon swim across the grey concrete of its undercarriage and pillars. Uninterrupted is a work of public art – film, installation, spectacle – that is an ooh-and-ah experience and a terrific use of public space. 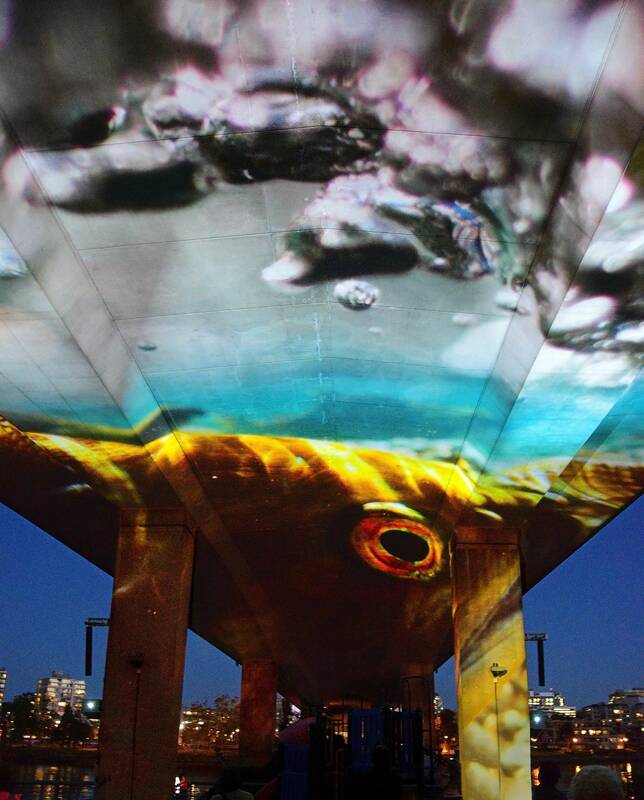 The project, with a budget of more than $2-million, was hugely complex to realize: shot underwater in various British Columbia locations over three years, edited partly in virtual reality and digitally mapped and projected onto the underside of the bridge using thousands of pounds of equipment, including eight massive projectors and four speakers, providing an immersive, quadrophonic sound experience. You swear you can almost smell the fish. This week, with salmon coincidentally in the news, the crowds have been even beefier – and there are more kids, too – as earlier sunsets have allowed the start time to move up an hour to 9 p.m. People hang out on top of one of the play structures or grab a primo seat at the bottom of a slide, but mostly they lie on the ground and watch the magic unfold above. "I think it's a miracle; I can't believe we pulled it off," director Nettie Wild says. "I still pinch myself every night." The idea came to Wild during a visit with friends near the Adams River in the B.C. Interior; it was 2010, a peak year for salmon – there were millions. "What I saw there changed my life. It was so profound. It was so heart-stoppingly moving and beautiful," Wild says. "I thought I was looking at colossal, moving abstract art." An accomplished filmmaker (she was working on her documentary KONELINE: our land beautiful while making Uninterrupted; she considers them sister projects), Wild wanted to create something that wasn't a traditional movie but used a cinematic experience to bring attention to the salmon migration that so enraptured her. "There's a real role for art to play in these controversial times," she says. But she didn't want it to be preachy or polemical. "I think my job is to deliver the wonder." Looking for a structure in Vancouver on which to project the work, Wild and editor Michael Brockington "ran into a forest of buildings made of blue-green glass," she says. Then they rode their bikes under the Cambie Street Bridge and just about fell off. "Because there it was. There was the bridge. If ever there was a Marshall McLuhan moment, this was it." The bridge runs over False Creek, where salmon once swam. It carries cars into downtown – with all the associated environmental implications. The spot even offers a viewing platform – the playground at Coopers' Park – that could shelter hundreds from the rain (although there has been no rainfall during any performance to date through this hot, dry summer). But would it work? Many digital-projection projects use computer-generated images, which offer a higher contrast. How would Wild's live river images do? "We did the test and we went, 'Whoa,'" she says – in a good way. "So the bridge presented a terrific opportunity and a learning curve that was vertical in terms of technical challenges. … Not to mention the fish – a cast of millions, none of whom take direction." It ultimately took a team of 130 people to create the work, including producers Betsy Carson and Rae Hull. "It's good that the idea was so irresistible because it's been a lot of work and puzzle-solving," says Hull, who dealt with the City of Vancouver, the department of engineering and the Vancouver Park Board and a list of funders on the massive, complicated project. "Being able to create this as a digital projection on a very technically complex surface makes this probably one of the most sophisticated digital-projection projects to date anywhere." The film was shot underwater. The cinematographers, using equipment weighing nearly 100 pounds, had to deal with strong currents and environmental factors over which they had zero control; one year, there were very few salmon. And always they had to keep the end game in mind – "shooting for a screen that's 30 feet high and half-a-mile long," Wild says. The camera had to be rock steady. Editing was a whole other level of challenging. Working with a computer-generated bridge and flat screens, the team needed to get a sense of what the film would look like when projected, but they did not have the budget to do much testing under the actual bridge. So they edited in virtual reality, using Oculus Rift. "The day we put those goggles on, blammo. We were under the bridge," Wild says. There was also the tricky calibration to consider, colour correction, getting the sound right in the active urban environment – and many other issues. But it worked. The 25-minute experience has audiences in awe – and sometimes in tears. "It's not weeping over the tragedy of our river; they're moved by this heartbeat that we can't lose," Wild says. "I just love it when people are mushballs at the end." At 65, Wild is not just on top of her game artistically, but is also pioneering this complex technology. "That is a pretty delicious place to be at this stage in my career; like, completely blowing the doors off everything that I've ever done and working with new people. It's really, absolutely exhilarating." So is Uninterrupted. If you can see it, do. It's in Vancouver on Tuesday to Saturday nights at 9 p.m. until Sept. 24.